It was a tough loss in Portland, as its fell in the 11th inning came after getting six straight scoreless innings out of the bullpen. Following an uneven start by Kevin McAvoy, Trevor Kelley and Ty Buttrey combined for 6 1/3 shutout innings out of the bullpen. Kelly walked one and hit one, but did not allow a baserunner, and Buttrey followed by striking out one and surrendering two hits in three frames. Richmond finally broke through against Jacob Dahlstrand for two runs in the 11th that proved to be decisive. In his second game since being promoted from Salem, Josh Ockimey got his first Double-A hit, a leadoff double in the 10th inning. He supplemented his 1-for-3 effort with a pair of walks. Jeremy Barfield remains hot after going 2 for 5 with two RBI. Little went right for Salem in its getaway-day matinee. Durin O'Linger struggled in his start, allowing six earned in 4 2/3 innings. He was followed by Pat Goetze, who made his High A debut by allowing 2 runs in 2 1/3 innings. Goetze was a 2013 draftee who struggled as a pro until adopting a low sidearm delivery before 2016. A trio of Dash hurlers held Salem to five hits. Two came off the bat of Jhon Nunez, who also had the team's only extra-base hit, a double in the third. In his seventh start for Greenville, 2016 first-rounder Jay Groome turned in by far his best effort of the season, dominating Asheville over six innings. The 18-yer-old lefty struck out eight of the 20 batters he faced while giving up just one hit and allowing one walk. He threw 60 of his 91 pitches for strikes, and completed six innings for his first time as a pro. He also induced six ground ball outs. Robby Sexton followed with 2 1/2 innings of scoreless relief, and Juan Florentino made his Greenville debut by finishing the shutout with 2/3 of an inning to pick up the save. Also making his debut with the drive was Brett Netzer. The third-round pick in June's draft was 1 for 4. Bobby Dalbec blasted his seventh homer of the year to supply all the offense Groome and the Drive needed. The scheduled pro debut of fourth-round pick Jake Thompson was postponed due to rain. The Spinners will take on Hudson Valley on Thursday as part of a doubleheader. It wasn't quite as dominant as the Greenville staff's work, but Edilson Batista and Eduard Bazardo combined to shut down the Orioles in their matchup against rehabbing phenom Hunter Harvey (BAL). Batista gave up just one unearned run in five innings, allowing four hits, and Bazardo followed by striking out seven in his four innings of one-run relief. Jagger Rusconi led the offense, going 3 for 4 with a double and two runs scored. Second-round pick Cole Brannen has been an on-base machine since his debut, and he added some power to that profile by ripping his first extra-base hit of his career with a fifth-inning double. Joining the parade of dominant starters in the low minors was Rafael Gomez. The 19-year old out of Venezuela struck out six and didn't issue a walk while scattering three hits across six shutout innings. In 44 1/3 innings, Gomez now has 48 strikeouts against just six walks, and he has 19 punch outs without a free pass in his past three starts. Willis Figueroa led the offense, going 3 for 3 with a walk, double, and two runs scored. In the makeup of the rain out on July 18, the Sox retook sole possession of first place in the Northwest Division. Alexander Montero made his first pro start in his second outing, going three shutout innings, allowing one hit and striking out one. At the plate, Rainaldo Ugueto scored twice and added a pair of stolen bases. 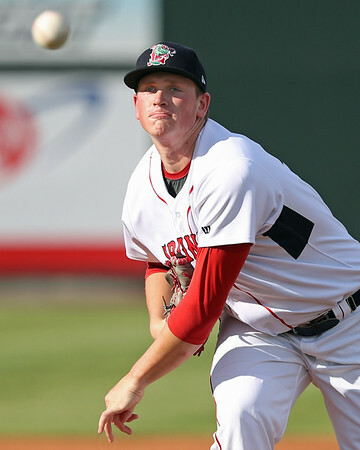 Player of the Day: Expectations were sky high entering 2017 for Jay Groome. The 12th pick in the previous year's draft, some analysts felt that he was the most talented player in the class. Despite some notable bright spots, his performance to date had been frustrating, but Wednesday's start game an inkling of the talent that made Groome so touted.